Satake knows that consistent quality is of great importance to any rice grower, trader, miller or purchaser. 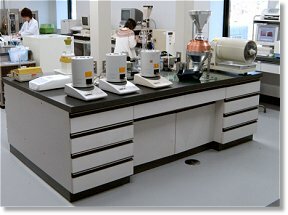 We produce a comprehensive range of rice testing equipment. Our laboratory huskers, graders and whiteners can be used for pilot and trial milling work. Our milling meter is the standard instrument of rice mill quality measurement in many areas of the world. The Satake Testing Husker is designed to provide rapid, accurate results in determining husking yields. It is manufactured to meet the requirements of laboratories, research and educational institutions. The Satake Testing Mill is a compact and handy machine that can be used to determine the approximate total white rice recovery in the whitening process. The machine is widely used throughout the world, especially in laboratories, research stations and educational institutions. The Satake Testing Thickness Grader is designed for use at a laboratory and rice mills for grading grains according to their thickness. It can be used for paddy, brown rice and milled rice by simply changing the hexagonal cylinder. The Satake Testing Rice Grader provides easy operation and precision grading. Accurate results are provided in the shortest possible time. The machine also features rapid indented cylinder replacement. The machine is designed for drying samples of grain. Up to 48 separate samples of grain can simultaneously dried by means of hot air (a smaller 24 sample machine is also available). This newly designed automatic temperature calibration device eliminates troublesome correction work for both ambient and grain temperature. The display shows the average value of the measure. The machine can measure the moisture content of paddy, brown rice, polished rice, barley, wheat and naked barley. The measuring range is 10%-40% (depending on product). The kit allows the rice miller to determine the milling degree of white rice. The chemicals in the kit highlight the bran remaining on the grain after milling.